There is an unwritten code of conduct among American diplomats that says they should never say anything that is untrue or inaccurate. They are not required to say everything they know because they must also keep secrets. But it is central to their mission to be truthful—not as a "moral" obligation but as a fundamentally practical one. The legendary American journalist Edward R. Murrow best expressed the rationale for American diplomats when he said, "To be persuasive we must be believable; to be believable we must be credible; to be credible we must be truthful. It is as simple as that." U.S. diplomats depend for their success on building trust with foreigners and other people they deal with in their work. To achieve that trust, they must establish a reputation of never deliberately misleading anyone by saying something that can turn out to be false. This is especially true of senior officials in Washington and American diplomats working at U.S. embassies abroad who engage in "public diplomacy" when they speak out in public. Their words carry official weight so they must be very careful what they say, and they are careful to be truthful and accurate. With the 2016 presidential election, American diplomats have two new problems in carrying out their task of explaining United States policy. One chronic problem is that the president has repeatedly said things that have turned out to be untrue. A second problem is that the president has made statements that later seem to be contradicted or modified by senior members of his administration. American diplomats have always operated on the assumption that what the president says is, by definition, official policy, and they expect all other US officials to follow the president's line, whatever it is. But it turns out that a major handicap for American diplomats today is that the current administration is sending confusing and often contradictory signals on what U.S. policy is. The most recent example of this disconnect is U.S. policy on North Korea. In early August, after North Korea threatened to fire missiles in the direction of the US territory of Guam, President Trump issued a strong threat to Pyongyang. He said, "North Korea best not make any more threats to the United States. …They will be met with fire, fury and frankly power the likes of which this world has never seen before." Did this mean he was preparing to go to war as a response to more threats? North Korean then did issue more threats, but the president did not react. Then, on September 4, immediately after North Korea reportedly tested a hydrogen bomb, the US ambassador to the UN, Nikki Haley, said that North Korea was "begging for war" but said the response should be to impose economic strongest sanctions and "resolve this problem through diplomacy." But U.S. diplomats still had to try to explain what the president meant by the "fire and fury" statement, apparently made on his own, without prior consultation with his staff. The North Korea confrontation has created special problems for American diplomats posted to China. They have always faced challenges, but under this administration these challenges have been multiplied. First, during the campaign, candidate Trump made a point of attacking China as a "currency manipulator." But as president he has apparently backed off from that charge, leaving our diplomats with some uncertainty about whether that was an issue they should pursue, inasmuch as he has later made positive comments about U.S.-China relations. Then, when the North Korean crisis heated up, and the president met with China's President Xi, he expressed optimism that China would help restrain North Korea, its main trading partner. More recently, as North Korea's missile and bomb tests show that it has not moderated an aggressive mode, President Trump has publicly criticized China for not restraining North Korea. This public rebuke increases the pressure on our diplomats in Beijing to define what the United States expects China to do. Disconnects on public statements have occurred also with respect to other parts of the world. American diplomats in the Middle East, for example, have for decades explained Washington's policy on the Arab-Israeli conflict as support for a "two state solution." This has been bedrock of our policy. But during the visit to Washington of Israeli Prime Minister Netanyahu, the president indicated that he was open to a one-state solution to the Arab-Israeli conflict, signaling a significant departure from the two-state policy. But following his statement, US ambassador to the UN Nikki Haley stated publicly that the US "absolutely" supports a two state solution. Was she contradicting the president? The president has also sent mixed signals about Iraq. When he visited CIA headquarters in January he made what appeared to be an off-hand comment on Iraq that perhaps the US should have "kept the oil" during its military drawdown there. He added, "I wasn't a fan of Iraq…but when we were in, we got out wrong… If we kept the oil you probably wouldn't have ISIS because that's where they made their money in the first place… Maybe we'll have another chance. But the fact is, we should have kept the oil." However, when Defense Secretary James Mattis later visited Baghdad and was asked about that statement, he took the opportunity to correct the impression left by the president. Mattis said "We're not in Iraq to seize anybody's oil". The president's mixed signals about Muslims have caused problems for American diplomats serving in Muslim countries. During the presidential campaign, Trump called for a "total and complete shutdown" of Muslim immigration. Some of his senior staff members have also expressed strong antipathy to Islam. The president signed an executive order entitled "Protecting the Nation from Foreign Terrorist Entry into the United States," that U.S. courts declared to be unconstitutional because they were directed specifically at Muslims. White House lawyers tried to deny that it was anti-Muslim, but when he signed a second executive order with the same title, the president stated publicly that the intention was to prevent "radical Islamic terrorists" from entering the United States. That apparent disconnect, along with his prior anti-Muslim statements, has made it difficult for U.S. diplomats in Muslim countries to explain the president's view of Islam. American diplomats posted to European countries have also had to deal with contradictory statements affecting their responsibilities. For decades, they have been able to reinforce strong U.S. ties to Europe through the concrete example of NATO, an institution in which America has shown leadership. However, as the GOP candidate during the presidential campaign, the president strongly criticized NATO, saying that the other alliance members should pay more of its costs. Then, once the candidate took office, Europeans took alarm when his speech at his first NATO Summit pointedly omitted mention of Article 5, which commits members to support each other in event of enemy attack. This seemed to indicate that the U.S. was now backing away from Article 5. Vice President Pence felt compelled soon afterward to express strong support for NATO and Article 5. But that correction has apparently failed to erase lingering doubt among our allies about the depth of the president's commitment to NATO. President Trump is new to political leadership and clearly not following the customary practice and rules that diplomats have become accustomed to. Those rules say the president's words are all carefully considered, reviewed in advance by the secretary of state and the professional staff who know all the issues well and consider the consequences of presidential statements. But the president apparently makes scant use of the government's vast resource of expertise on all issues, which could be consulted before he speaks. He does not always include Secretary of State in policy discussions. His inclination to state publicly whatever comes to mind compels other officials speak out to qualify the first impressions left. 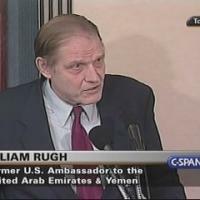 Author William Rugh who holds a Ph.D. in political science is the author of "Arab Mass Media" and many articles on Middle Eastern subjects, as well as two books on public diplomacy. He was a U.S. Foreign Service officer for 30 years, and during that time he served at embassies in six Arab countries, including as American Ambassador to the United Arab Emirates (1992-95) and as Ambassador to Yemen (1984-87). During his career he held several public diplomacy positions, including Area Director for Near East and South Asia (1989-92), and PAO in Egypt and Saudi Arabia. Between 1995 and 2003 he was President of AMIDEAST, an American non-profit organization. He is currently the Edward R. Murrow Visiting Professor of Public Diplomacy at the Fletcher School of Law and Diplomacy at Tufts University and a member of the board of directors of the Public Diplomacy Council.